EA have done a solid job porting FIFA across to Switch and Football Manager is as thorough as its counterparts, but me, oh my, New Star Manager is incredibly addictive. Maybe you remember a game called New Star Soccer from a few years back. You know, the one on your mobile where you don’t have to like football but you can’t stop playing because your young starlet needs more bux to buy four houses, ten cars, and a swimming pool. New Star Manager is a full-blown sequel to that same game. It originally came out on mobile last year but has now made the big step towards consoles, Switch being the logical first stop. The good news is that’s as much of a time-sink now as it’s ever been and the perfect fit with the combination of touch and button control. The bad news is that it is hindered by a few technical issues which detract from the experience a bit, though nothing a patch or two won’t sort out. So the big difference this time is that you’re playing as the manager of the New Star Football Team, starting out at the bottom in the National League. You’re two points adrift of safety when you take the reigns and your first job is to stop your team getting relegated. Fortunately, the game gives you a bit of a helping hand along the way so you can get to grips with the controls and find your feet. And there is a lot to take in. You’re not just dishing out team talks and figuring out formations, you’ll need to build facilities, hire staff members, take interviews, develop players, appease sponsorships, board members, fanbases, all while making sure you don’t go bankrupt. Transfer deadline day doesn’t seem so easy now, huh? This probably sounds daunting at first, but the barrier for entry is far lower than Football Manager. In fact, you can become quite adept at all of this within an hours’ play. This is essentially a card game mixed with Subbuteo and you’ll have a wealth of Achievements to help determine what you should and shouldn’t be doing. For each level gained, you’ll earn a pack of cards which can be opened and often give you things like new players, stat increases and energy drinks, which help give tiring players a boost when they’re on the field. Cards can also be gained at the end of each match where you can handily choose the type of boost you want. It’s a surprisingly deep, involved game, that doesn’t necessarily require you to like, know, or get football, but you can certainly get a kick out of beating rival teams or understanding how a combination of formation and gameplay can win you every trophy under the sun. I will say that the on the pitch action isn’t even in the same league as FIFA. 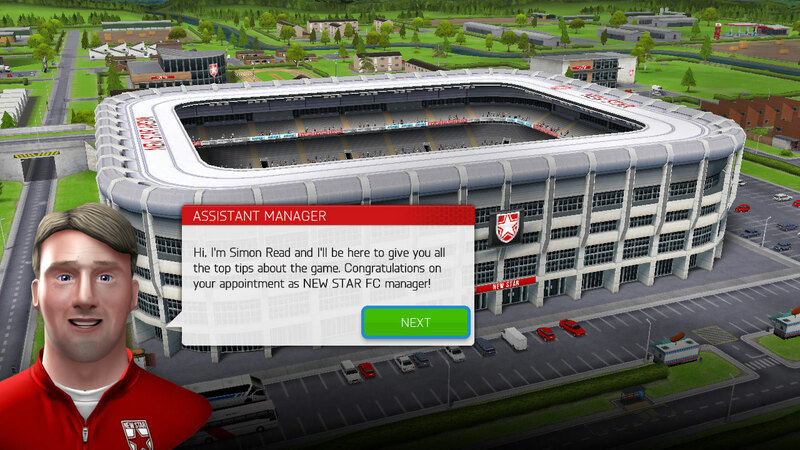 New Star Manager is relatively easy-going and simplistic in comparison. That said, it’s a substantial upgrade from New Star Soccer. 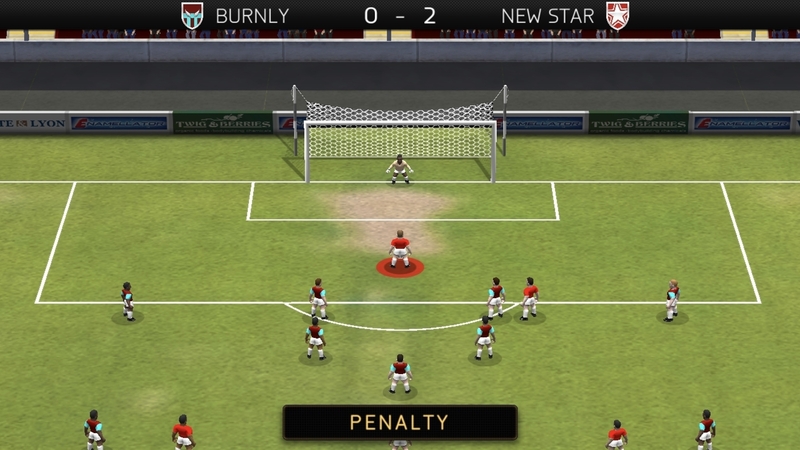 You can pass the ball easily around the pitch by tapping on a player or drawing a line to them. You can also go on a bit of a run up the pitch and take a shot on goal, tackle an opposing player, take free kicks, penalties, and even corners. It all boils down to tapping the ball in the right spot or catching it at the right time as it sails across the screen, angling it in such a way that it will whizz past players and wrongfoot the goalie so your player can go onto immortality. Like I said, on the pitch this is no FIFA, but all elements combined, the experience is a memorable, enjoyable, and addictive one that you’ll find yourself coming back to time and again. You’ll want to prove you can take a team to the dizzying heights of the Premier League and beat the best in the world to claim the ultimate glory. It offers a hook in its career mode with the combination of stats and success that, honestly, I just don’t get from FIFA’s take on events. There’s great satisfaction in gradually building a club from nothing, expanding out the stands when the fanbase starts to grow, earn lots of money from smart transfers and endorsements, ease players onto a faster road to recovery with improved facilities. But also dealing with the unexpected like red cards which rule your best players out of crucial matches, and hard-to-attain targets from the board when your job is on the line. New Star Manager is better than its predecessor in every conceivable way and is one of the most engrossing management simulators I’ve ever played. It’s a very worthy addition to the Nintendo eShop. However, there are some issues which do need to be looked at. For instance, there is occasionally severe lag when interacting with the screen. Tap something once and it can take up to ten seconds to respond, all while freezing the screen in the process. Sometimes the screen transitions also come across as laggy, practically dragging the previous screen along with it. This can also cause the sound effects to often hiccup and stutter as they struggle to keep up. I’ve even had the game hard-lock up on me once or twice, which is quite possibly the first time that’s ever happened to me on Switch. The performance of the game definitely came as a surprise, but I imagine the engine used has probably got some compatibility issues with the hardware since it’s new to it. Hopefully a few QoL updates should put things right. However, between the choice of playing with detached Joycons, in handheld, or on the big screen, along with all improvements and tweaks from mobile, the Switch version of New Star Manager is the best version of a fantastic game. And for my money, the most satisfying football experience on Switch. The eShop continues to get all of the gems and this one deserves all your bux! Review code kindly provided by the publisher.